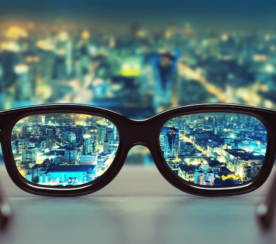 Is keyword research part of your marketing routine? What about niche question research? 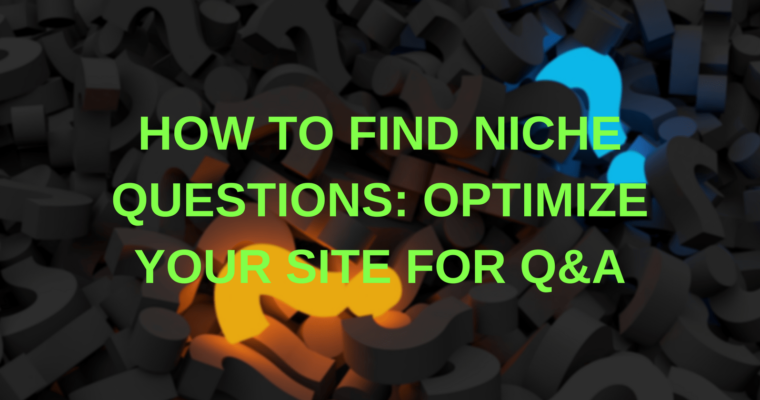 Niche questions may boost your content marketing on so many levels! 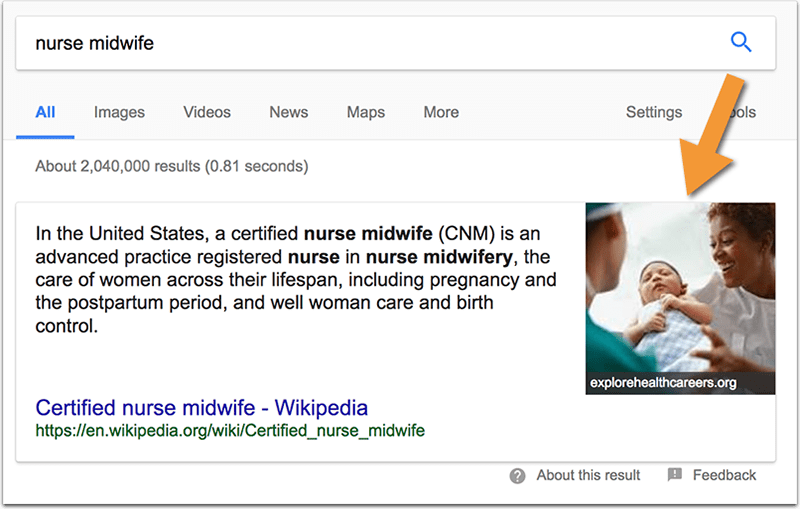 Google is highlighting the best answer to the search query in a featured box on top of all search results. That’s a great way to put your brand on top of everyone else! Question research helps with mobile search optimization too: Seeing which questions people tend to put into the search box lets you understand natural language better, the way people would put it using speech-to-search technology, so optimizing for questions means looking into the future of search. When you ask a question, it prompts a user to stop and think which leads to a lower bounce rate which, in turn, results in a higher probability of a conversion. Asking a question triggers a natural answering reflex which means you’ll convert all those lurkers into attentive listeners. Once they listen, it will be up to your offer to lure them further into your conversion channel. Higher trust from clients (which also positively impacts your conversion rate). Better secondary CTA performance (those email signups which will convert into customers later on). More return visitors (who are more likely to buy). Collect popular industry-related questions and you’ll know what kinds of problems your customers are dealing with on a daily basis. Be the best to solve those problems and you’ll win their hearts forever! Writer’s block can hit whether you are a creative or a technical writer. Trying to come up with topics for a blog, as an example, can be really difficult. After all, you constantly have to come up with new ideas, or at least fresh takes on old ones. Not only are you doing that for your own content, but you are also competing with the millions of other bloggers out there, many who are writing about the same thing. One of the easiest ways to be inspired when I am in a dry spell is through questions. These marvelous little language nuggets can spark a whole symphony of new thoughts, concepts, and even other questions that can inspire you further. Now, giving answers on your site starts with a thorough and continuous question research, here are nine tools to help you out with that part. Serpstat is a search query tool that lets you find out how people are using popular (or unpopular, your choice) keywords around the web. It is great for data collection, especially as it gives you information in a way you might not expect. 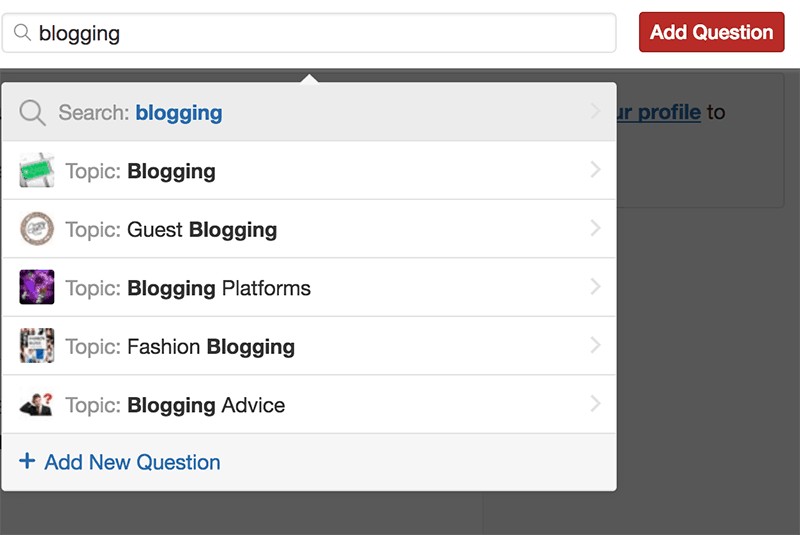 They have a separate section called “Questions” which hides behind “Content Marketing” section. It works by having you search for a single “base term” at a time. You can select a “Questions” tab that uses a separate algorithm that specifies interrogative queries. Then you can export your results so it can be saved. 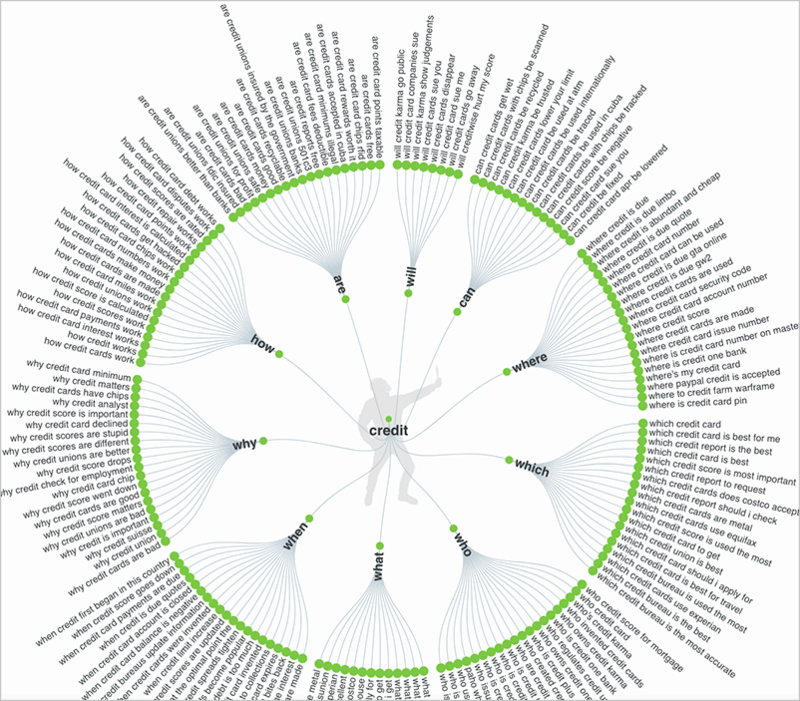 Serpstat generates a tag cloud based on most common words that can be found in those niche questions. Clicking any word in a tag cloud will filter questions to only those containing that word. That’s a great way to define the structure of your future article. 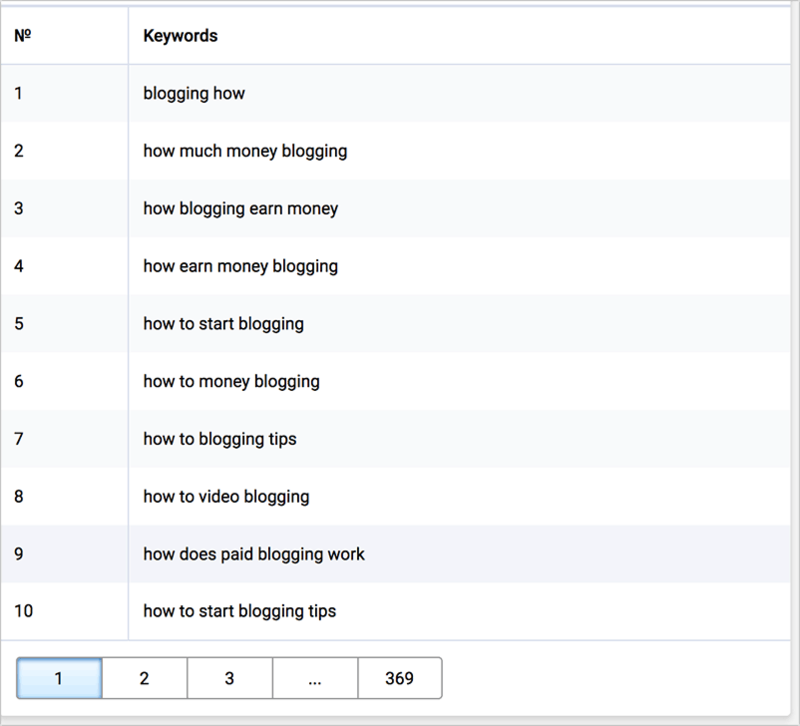 Other keyword suggest tools are UberSuggest and Keywordtool.io. Google Suggest gives a lot of insight into what people tend to type into the search box: The more people type a phrase and click “search”, the higher the phrase will appear in the as-you-type drop-down when you are starting your search. AnswerThePublic is a free tool that takes Google Suggest database, identifies question-type queries there, and creates a visual map of popular questions with your core term in them. The problem with the above tools (albeit great and must-use) is that they tackle already discovered opportunities: Those you or your competitors are already ranking high. 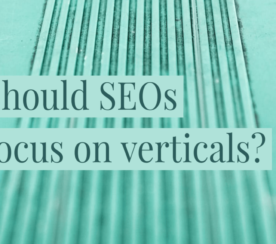 But how about venturing beyond that: Ask your readers, customers, and followers how they search and which questions they ask. This articles goes beyond traditional keyword research tools and tries to offer you something new. 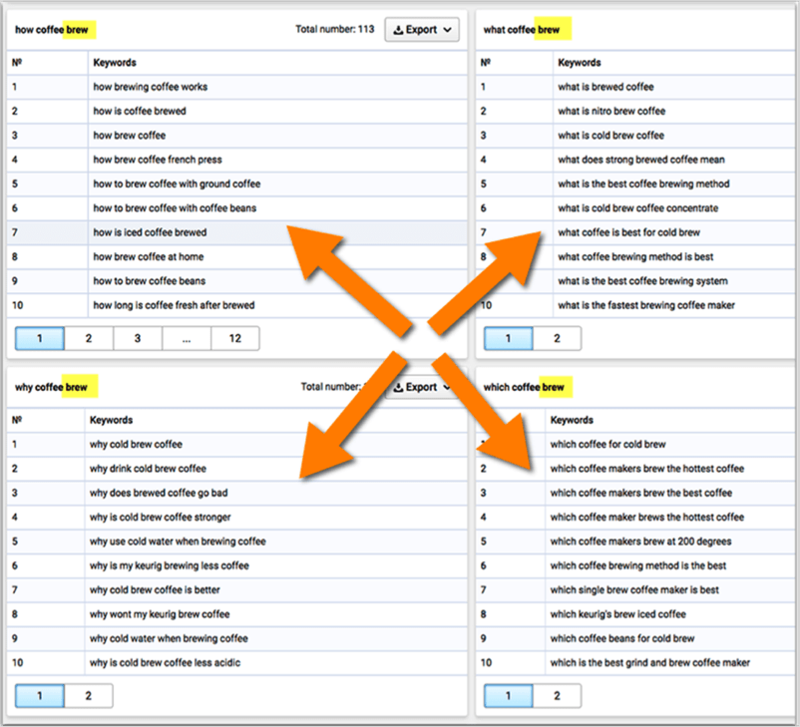 Your question research starts with the good old keyword research. It gives you a valuable insight into most popular questions people ask most frequently. Most of these questions will need a separate section on your site to cover. Think about setting up a glossary or a knowledge base (or both) section on your site to address most frequent questions in your industry. Here’s the Google’s box you’ll find useful for question research (it will expand further and further as soon as you start clicking questions in it). 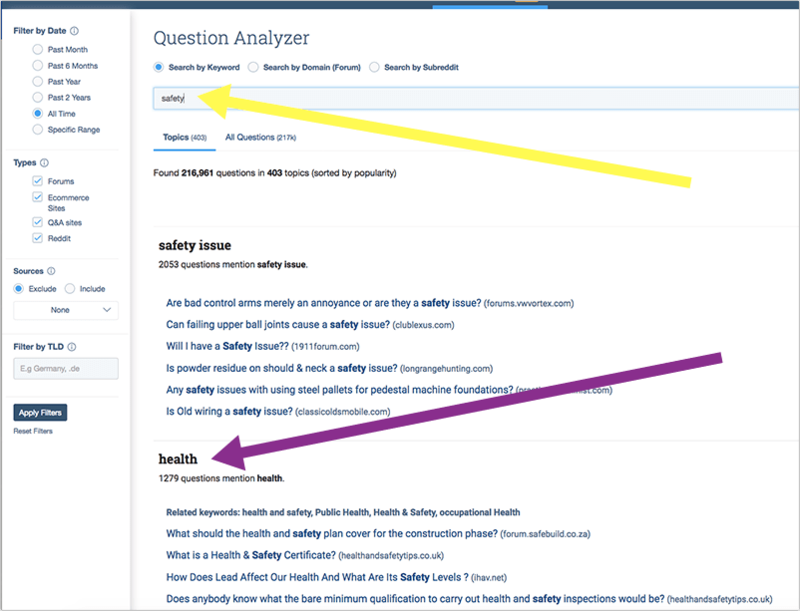 BuzzSumo has recently launched their “Question Analyzer” feature allowing you to search multiple discussion boards at a time (including Amazon Q&A) to quickly see the list of discussed questions. They will also use semantic analysis to let you see related questions (those using a different keyword from what you entered but which are likely to be very much related). This allows you to expand your research and look outside of the box. Online “Ask Me Anything” interviews give a great insight into what interests people in your industry. 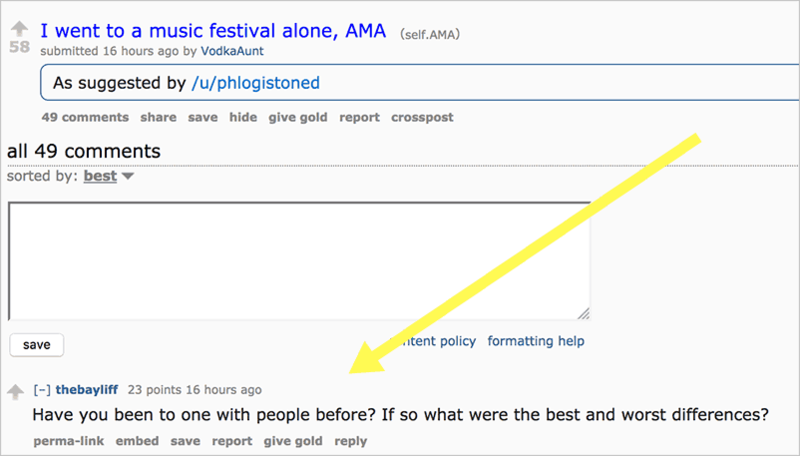 Try searching Ask Me Anything Subreddit for your primary keyword and go through users’ comments to see most voted-for questions people ask a notable figure in your industry. AskReddit is another valuable research you need to monitor for great questions in your niche. It always works wonders for my inspiration! Your customers are your most valuable source of content inspiration. Your site should address all their needs and concerns which not only relieves your teams of the need to answer the same questions again and again but also attracts more customers. Therefore most of your customers’ questions should be treated as potential content ideas. Use your current customer or sales management platform to record and escalate all the questions to the content team. I use Salesmate because it keeps my sales process organized and easy to delegate between the departments. 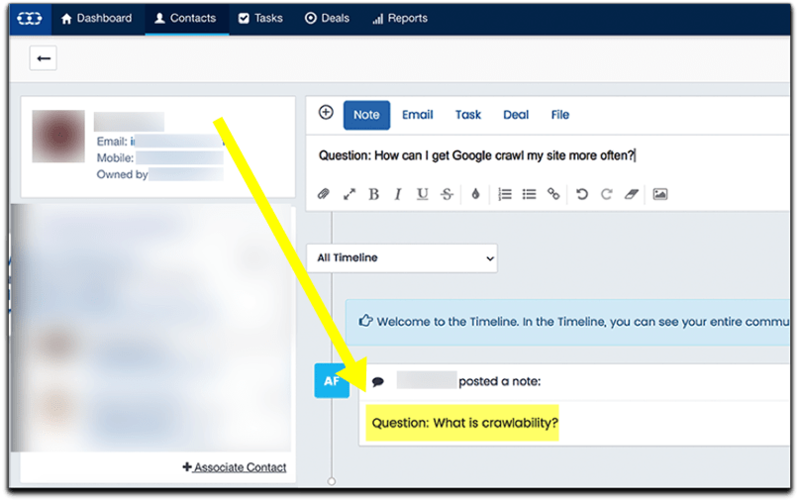 You can integrate Salesmate with Slack or Gmail to record your customers’ and team members’ questions from there. While Google gives a lot of insight into most popular questions, Twitter would bring up less obvious, yet trending questions people are interested in at this very moment. I use Cyfe to monitor and archive Twitter search results. Simply use ? (with the space) after your primary keyword when setting up your Twitter search widget inside Cyfe. Quora is a must-have platform to monitor for question research. It doesn’t make it too easy to monitor it but you can set up your dashboard using your core terms and login from time to time to the site to scroll through popular discussions on the topics of your choice. One of my favorite ways to find inspiration is by following a category and then checking daily for new questions. That way, I find questions I may have never considered myself. There is an additional benefit of making connections, as well. You can answer questions, and establish yourself as an authority. Further reading: Quora Community Rules: A Starter Guide for Joining the Conversation. Here’s also a great tutorial on how this Q/A content can be turned into a whitepaper. 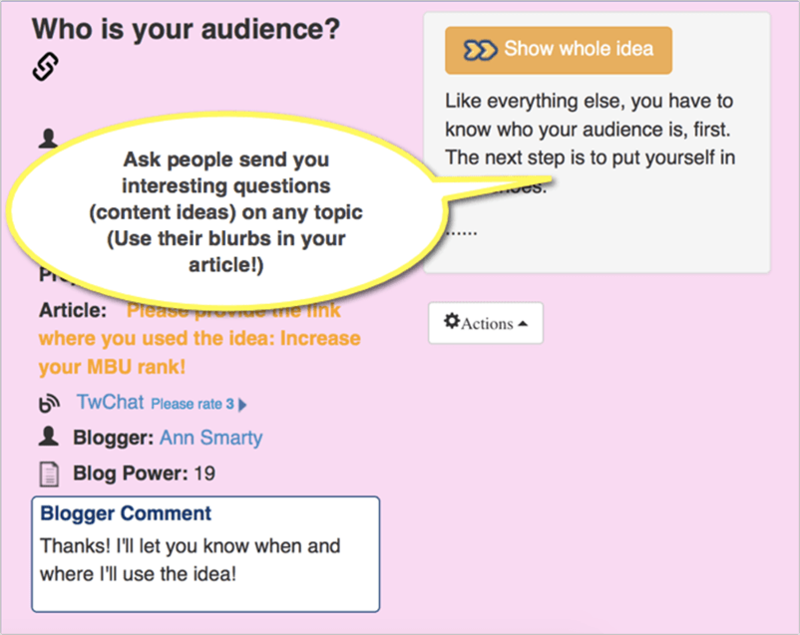 MyBlogU (Disclaimer: I am the founder) isn’t so much a question site, as it is a way of crowdsourcing content ideas. But it utilizes the brain power of many to come up with a single, shining idea to work off of. To get people send you topical questions, all you need to do is to create a brainstorm request and ask people to send you the questions that interest them on the specified topic. The beauty of the platform is that everything being sent to you remains private, so the article gets partially written for you by your fellow MBU users. 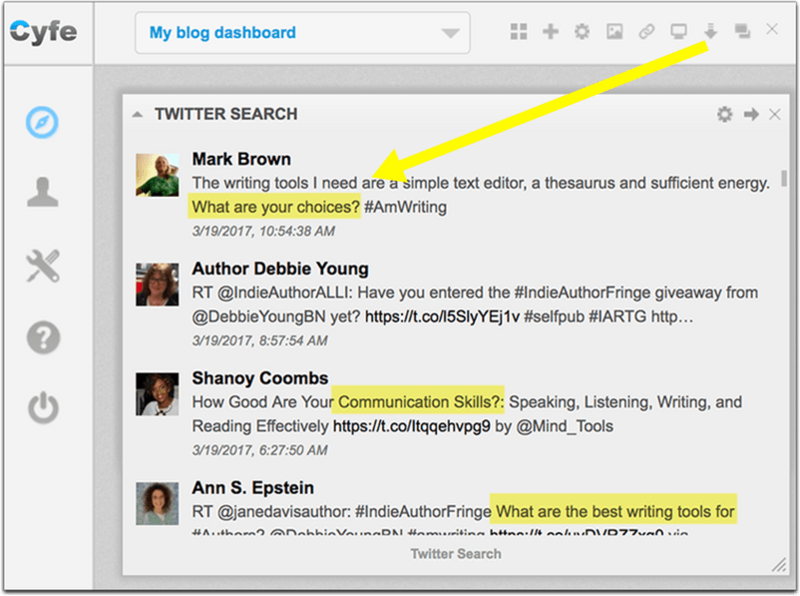 Here’s how MyBlogU improved my writing productivity. On the other hand, you can also contribute to other requests, and will be cited by those who use your answers and quotes. So it is an effective authority and brand building tool too. Featured Image: Pixabay, modified by Ann Smarty, November 2017. Screenshots by Ann Smarty. Taken November 2017.